Ted's bedroom has forever been my favourite room in the house. I remember snugging up with a blanket and the laptop and writing letters to him when I was pregnant. I remember hiding in there when I got scared about giving birth or the world just got too tough and now I can share this special place with him it is even better. Despite night times being stressful at the moment he has had 2 years of sweet dreams in there and it is the place where all his favourite things can be kept, his own little sanctuary. Doing his room up when he got his big boy bed was something I thought was quite important. 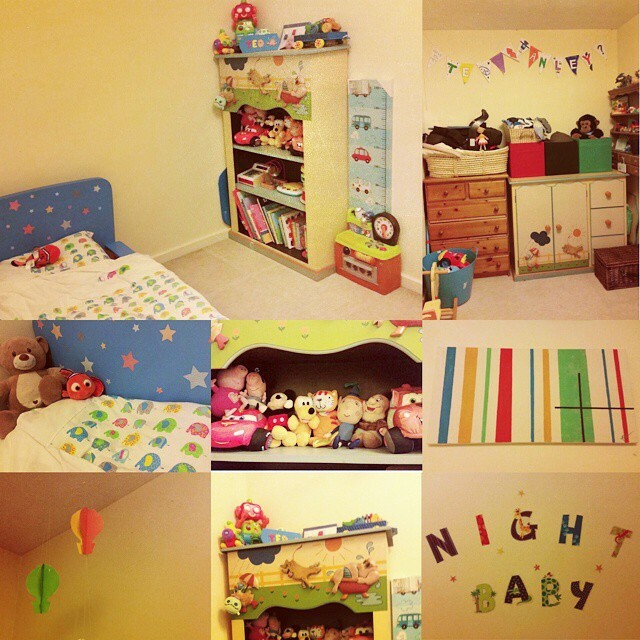 Moving furniture and getting all of his baby bits out (minus a few cards and cuddlies) and making his room into a special toddlers room. We managed to do his room up on such a small budget, utilising furniture we already had and picking up bits from bargain basements, Freecycle and upcycling. 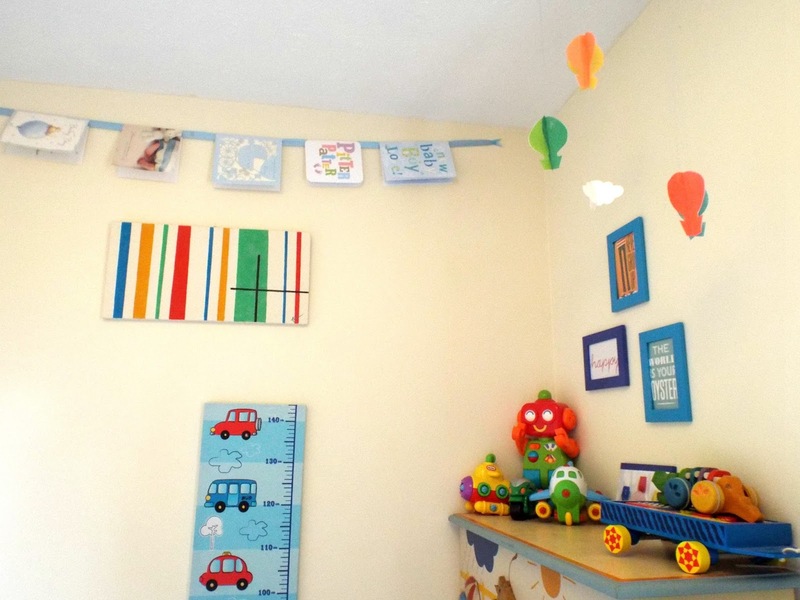 As we rent our house we decided decorating wasn't an option so used wall art and decorations to add splashes of colour. I love the colours and decided that general primary colours worked best as we could pull together everything we had rather than sticking to a specific colour scheme. These cards are from when Ted was born, they have been up since then but I love the colours and think they remind us all of good times so left them up. I actually painted the striped canvas 5 years ago and love how well it fits in with the colours. Ted has a little car height chart that he got from my Mum, he loves it and I think it helps to break up the boring magnolia walls alongside the framed postcards from Paperchase and Got2Jot. They cost less than £1 each and popped into the blue Ikea frames I think they are really effective. All of these frames are mounted on the wall using 3M Command strips which are like super double sided strips that don't leave marks on the walls and are really easy to use! On the window sill we have a gorgeous frame from Namesake Gifts, a fantastic new online store founded by a school friend of mine. She is so talented and I love her unique designs. This box frame with a cute bunting design is simple but gorgeous and works so well in Ted's room. Do pop by and have a look at her designs, they are fantastic and a great gift idea. Those of you who read the blog regularly will have seen 'Small Nemo' in numerous photo's of Ted. He has had his comforter Nemo since he was born and we have since purchased several more Finding Nemo toys for him. I love these cushions from the Disney Store. I picked one up from a charity shop for £3 and my little sister found one at the back of her cupboard that she has had since she was small! We love a bit of Poppy Cat too and these two were from Ted's Nana Wendy for Christmas. I love how he has such a wide range of toys and despite me vowing he would never have character toys it is quite hard not to be drawn into the cuteness of them all! Here are some more 3M Command products. These stick on hooks are great and on the back of the door they are a really handy place to store dressing gowns, fancy dress costumes and onesies that normally would take up valuable room in Ted's cupboards. This shelf is one of my favourite area's in the bedroom. It is our place to store special things out of the way of tiny hands and keep them safe but also display them nicely. We have been gifted so many lovely toys that I would love Ted to have when he is bigger but are just that bit too breakable at the moment so up here is their home. I forgot to get it in the picture but it is on the video below. Joe's friend got Ted a World of Warcraft Megablocks set when he was born and the dragon sits in pride of place on the top shelf, Daddy is very proud! This furniture has been in here since before Ted came along and my Dad actually picked it up cheap from work one day. It is custom made and hand painted. The set comprises of this cupboard with 3 big drawers in and I used it as a changing unit and the large bookshelf complete with hidden storage box in the top. I love how much storage space it provides and it is something nobody else will ever have! As I mentioned we have picked up quite a lot of furniture for our home from Freecycle including Ted's amazing Ikea bed frame. I have had my eye on a Mammut bed base for a while now, coming second favourite to the Kura bed which I have always loved. Imagine my excitement when we got this one for FREE! It was being given away by a family 5 minutes down the road from us, it has a few scratches but after a good scrub down I was happy for Ted to sleep in it. We added the star wall stickers from Tinyme to make it special and Ted loves it. The Ellefunk bedding was sent to us from Baroo and the elephant print is adorable. We unfortunately had an incident involving a sickness bug on holiday in Center Parcs and the bedding sadly went in the bin. I don't know about you but travelling 2 hours in the car home with sicky bedding was not something I was ready for! The duvet and pillowcase covers did get lots of use before disposal though and was so soft and washed well which is always a sign of good quality bedding, nobody likes crispy bedding after being in the machine! 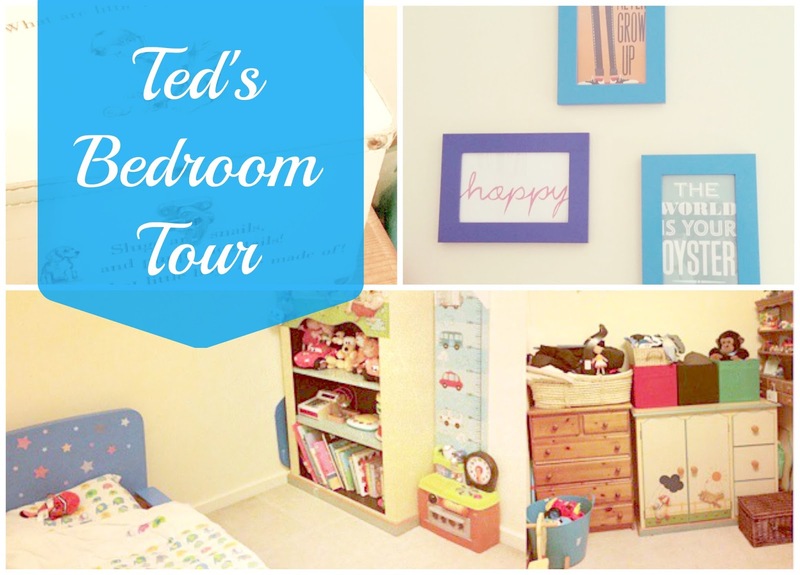 Check out Ted's Bedroom Tour below for a nosy around the room. Don't forget to pop over to subscribe to my channel for more videos! *I was sent 3M Command, Baroo and Namesake Gifts presents for the purpose of my honest review.